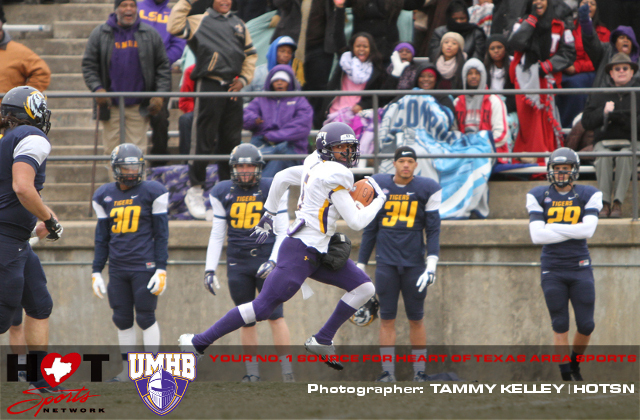 BELTON – University of Mary Hardin-Baylor football players Teidrick Smith and Kamray Runnels have been named American Southwest Conference Players of the Week for their performances in the Cru’s 83-19 victory over East Texas Baptist University. Smith was named Co-Defensive Player of the Week while Runnels was named Special Teams Player of the Week. Smith, a sophomore defensive end from Hallettsville High School, had eight total tackles, 2.5 sacks and scored his first collegiate touchdown on a 36-yard interception return. He also added two quarterback hurries to lead a UMHB defense that posted seven sacks, forced six turnovers and scored four touchdowns on the day. Runnels, a senior wide receiver and punt returner from Edna High School, had an 81-yard punt return for a touchdown in the win. He finished with three punt returns for 105 yards and added a 31-yard kickoff return to go with two receptions for 46 yards. Runnels also had another 57-yard punt return for a touchdown wiped out by a roughing the punter penalty. The Cru closed out the regular season with a 10-0 overall record and won the ASC title with a 5-0 league mark. UMHB will now advance to the NCAA Division III National Championships for the 13th time in the 17-year history of the program. The 32-team field for the postseason will be announced on www.ncaa.com at 5:00 PM Central Time on Sunday, November 16th.